Much like an illness, you can tell if you have a debt problem based on the symptoms that can arise. We call these symptoms ‘debt danger signs’. As part of Debt Awareness Week we’re discussing the five danger signs to help you avoid them, or if you’ve tried to deal with your finances in this way, how to get help sooner. The third of the five danger signs is applying for a debt consolidation loan. While consolidation loans can work for some, it’s often a sign that you’re struggling. Let’s investigate why this is the case. Debt consolidation – why might it be a problem? If you’re tempted by debt consolidation it could be a sign you’re in trouble. 59% of our debt management plan clients applied for debt consolidation loans before seeking debt advice. Many find that these loans actually made their situation worse. “Every loan I ever took out was a debt consolidation loan. “It started when I was a student – I borrowed £6000 to repay 3 credit cards and my overdraft – which I did, but kept the cards and the overdraft and ran them up again. I’m thinking about taking out a debt consolidation loan, how might it go wrong? When you start talking about planning a budget many people’s eyes will glaze over. Some will start running for the door. And OK, I’ll admit that talking about budgeting isn’t the most exciting pastime, but there are few things that take so little time that can save you so much money. Get started with planning a budget and if you’d like a bit of extra help our online Debt Remedy advice tool will guide you through a budget and even suggest realistic figures if you get stuck. Many people have woken up the day after a boozy night out with a thumping hangover and vowed “never again!” The same kind of thing is said about taking out taking out more credit after taking out a consolidation loan. The issue is this: many people run up debts because they’ve relied on credit to live. With an extra loan payment to think about it’s often even harder to cope. A number of people tell us that they’ve taken out debt consolidation loans and ended up running up their debts again. Planning out a budget and cutting up your old credit cards are great ideas if you’re wanting to get a grip on your finances but these decisions are usually made when you’re at your most sensible and organised. Then you get a text saying your mates are planning a night out, or an email from your favourite store with a discount code. These are the moments when you’ve got to make your budget work in the real world. If you find yourself splurging your cash then you’ll quickly find that you’ve run out of money before payday. This is bad at the best of times but if you’ve got a debt consolidation loan out already then it could mean you’ll not be able to cover your payments. An Englishman’s home is his castle, and just like knights used to defend their castles, you should defend yours. We’re not talking dragons or invading armies though; we’re talking about secured loans and remortgages to pay off unsecured debts. Taking out a secured loan (or remortgaging) to pay off unsecured debts is a big financial risk. It means having more debt stacked up against your home and, if things don’t go to plan, your house is at greater risk of repossession. For that reason we think that secured loans aren’t a great idea for debt consolidation. I hated maths when I was a kid. Long division and trigonometry would bring me out in a rash. If you’re the same as me then it’s likely that the numbers involved when looking into debt consolidation can be more than a little bit confusing. When considering a debt consolidation loan it’s important to look at the total interest you’re going to pay. Even if the interest rate sounds low, if you stretch a loan over many years (which often happens with consolidation loans) then you could end up paying an awful lot back in the long run. 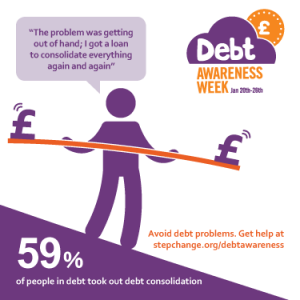 Try our StepChange Debt Danger Signs tool to see how many apply to you, how to avoid the others, and how we can help with free and impartial debt advice. Client quotes obtained in debt danger signs survey, Dec 2013.